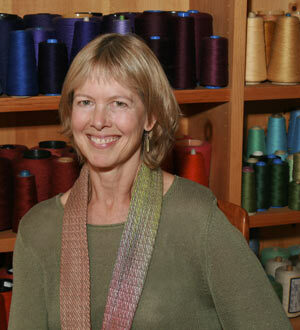 Reminder: Next Wed. evening is lecture with Jennifer Moore! There is parking across the street from the library in addition to the regular lot. This is for all guild members. Please join us in welcoming Jennifer. Jennifer Moore Lecture – open to all guild members !! As you may know, we have a 2-day Doubleweave workshop scheduled with Jennifer Moore on Thurs., May 24 and Fri., May 25, which is FULL, but in addition to this we have booked a lecture on the evening prior, Wed., May 23rd at 6:30 p.m. Currently this is taking place at the Chagrin Falls branch of the Cuyahoga Library at 100 East Orange St., Chagrin Falls 44022. We are in need of a PC laptop with Power Point for the evening. The library has the digital projector setup as part of the meeting room. Please contact me if you can come at 6:10 pm with a laptop that Jennifer can plug a USB into with her talk. You can reach me at 216.337.3450 or beemerquilter@yahoo.com. Thanks so much. Oh and the lecture is entitled: Chromatic Fantasy: Music, Math and Magic in Doubleweave! Just an FYI to let you know that we have filled the Jennifer Moore workshop. I have a waiting list started just in case. Thanks everyone. Can’t wait until May!